The second round of the New Zealand Football Championship kicks off tomorrow with some exciting matchups up and down the country. 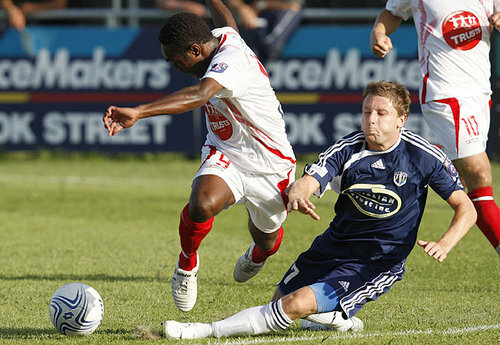 On Saturday Auckland City travel south to Ngaruawahia to take on Waikato FC at their new home – Centennial Park, while YoungHeart Manawatu host Team Wellington at Memorial Park. Sunday see’s Canterbury travel to Dunedin to face Otago in the battle of the South. – Auckland were one of four first-round winners and with champions Waitakere taking a week out to test themselves against the Wellington Phoenix, the three-times former champions can take an outright lead with victory over Waikato. Waikato have planned a family atmosphere their new Ngaruawahia digs and points against their northern neighbours would only add to the festivities. – Fellow first round winners YoungHeart have the same opportunity to grab the lead if they can back up at home to Team Wellington. Former capital favourite Ref de Gregorio makes his first appearance against his old club, who showed enough against Waitakere last weekend to suggest they could still be a contender this season. – Otago and Canterbury, the bottom two clubs from last season, find themselves at or neat the foot of the table after round one. But it’s early days and a fiercely contested southern derby is a chance for at least one club to put themselves back in contention for a semi-final spot. The players: Late signing Michael Mayne joins the matchday squad with Edmondson yet to decide who drops out. The vital statistics: In three games outside Hamilton last season, (all against the bottom three clubs) Waikato lost to both Otago and Manawatu and drew with Canterbury. All games were at Links Ave, Mount Maunganui. The players: Greg Uhlmann returns from a carried over suspension, while Liam Mulrooney could make his first Auckland appearance in two years after being included in the match-day squad. Salesh Kumar drops out of the 16 and Adam McGeorge (ankle – 4-6weeks) joins Xavi Roca on the injured list. The players: Adam Cowan is unavailable through work commitments while injuries to Jason Hayne (groin) and Leo Shin (Achilles) have left YoungHeart with a threadbare squad for Saturday. Hayne and Shin face late fitness tests with Sova hopeful of having one of the pair available. The vital statistics: Good omens? In two seasons (05-06 and 06-07) where Manawatu have begun with Round One win, they have gone on to make the playoffs. Squad list: 1-Chris Marsh (GK), 3-Pablo Yackson, 4-Jan Weissenfeldt, 6-Matt Kennedy, 8-Nathan Cooksley, 9-Gusatvo Saralegui, 11-Scott Robson,12-Dave Boyack, 16-Raf de Gregorio, 18-Finlay Milne, 19-Andrew Bailey (GK), 20-Gonzalo Nieres, 21-Brook Tozer, 22-Cory Chettleburgh. 12. (subject to fitness test). Brian Little is once again included after a late withdrawal from last week’s squad. The vital statistics: Team Wellington beat Manawatu 3-1 at home in round two last season but neither of the goal scorers (Graham Little, Daniel Ellensohn x2) are in the squad this season. The players: Blair Scoullar sits out with a knee injury allowing Morgan Day and Tom Connor to line-up in the match day squad. The vital statistics: Otago’s home defence (14 conceded in 10 games) was the best outside the top four last season. Squad List: 1-Liam Little (GK), 2-Rys Henderson, 3-Tristan Prattley, 4-Barry Gardiner, 5-Colin Falvey (Captain), 6-Michael Smith, 7-Robbie Deeley, 9-Tom Jackson, 10-David Dugdale, 11-Andy Coburn, 12-Aaron Burgess, 13-Callum Flaws (GK), 14-Sean Brand, 15-Morgan Day 17-Tim Horner, 18-Tom Connor. The players: Stuart Kelly is still short of full fitness, so Korouch Monsef has given attacking midfielder Hamish Chang a promotion from the club’s academy. The vital statistics: Canterbury’s 2-0 win in the third Southern derby in Round 16 last season snapped a 16 match winless streak.